Ward's Island Building, N.Y. 1860. A beautifully drawn view of the Ward's Island, N.Y. The island is situated in the east River in New York City, and is now joined to Randall's Island to the north by landfill. When Dutch settlers appropriated the island in 1637, it was known as 'Tenkenas,' or 'Wild Lands,' and the name changed several times, until after the Revolutionary War, when brothers Jaspar and Bartholomew Ward took ownership. A small population had lived on the island since the 17th century, but the Ward brothers developed the island by building a cotton mill and the first bridge to cross the east River, connecting the island with Manhattan at east 114th Street in 1807. When the bridge was destroyed by storm in 1821, the island was largely abandoned until 1840, when it gradually became a dumping ground for everything unwanted in overcrowded Manhattan: almshouses, the New York City Asylum for the Insane, and potter's fields (hundreds of thousands of bodies were relocated from the Madison Square Park and Bryant Park potter's fields). 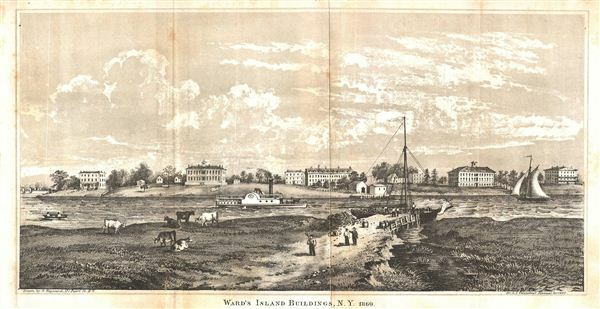 The city purchased Wards Island outright in 1851. From 1860 until the 1892 opening of ellis Island, Wards Island (along with Castle Clinton on Manhattan's southern tip) welcomed America's newcomers at its immigration station. Drawn by G. Hayward of 171 Pearl St. N.Y., for the 1860 edition of D.T. Valentine's Manual.